Barcode Graphics offers low price, fast-turnaround, high-quality labels to complement our existing line of EPS barcodes, nutrition facts graphics & services, barcode verifiers, and thermal-transfer printers, labeling software and barcode scanners. 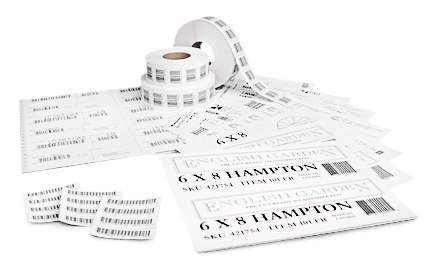 Label runs can be long or short, sequential or static, rolls or sheets or strips. Color labels on rolls are also available, and there are no limitation/costs associated with dies. Our thermal labels do not smudge or smear (as do those produced with low-quality thermal wax ribbon, or direct thermal stock). The labels are available in a variety of sizes and also in specialty face stocks (tear-resistant, waterproof synthetics, etc). All labels are tested for barcode quality to assure compliance. Barcode Graphics can provide ISO/ANSI Barcode Certificates of Compliance, an issue of importance to those supplying barcodes large retailers. Barcode Graphics provides specialty labels for applications such as: Nutrition Facts overstickers, Canada Customs Labels (B3, Cargo, PARS) and US Customs Labels (PAPS). Many label stocks available: paper, synthetic, tear-resistant, taper-proof, asset marking, etc. Many adhesives available: permanent, removable, low-tack, taper-evident, freezer, tire, etc. List of available thermal transfer barcode label sizes and their prices. We also supply blank laser labels. Perfect for on-demand in-house printing.